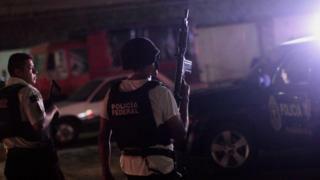 Police officers came under attack in a two-hour gunfight in the Mexican city of Acapulco, officials say. Several gunmen attacked a hotel where officers stay, in the tourist area Las Playas on Sunday evening. Dozens of people had to shelter in shops while shooting continued, until after 23:00 local time (04:00 GMT). One suspected gunman was killed when police returned fire. Officers then chased other gunmen through the streets before securing the area. At the same time, a separate group of gunmen attacked a federal police base in the city. Mexico's federal authorities have called an emergency meeting with the local authorities to discuss the incident. Guerrero state Governor Hector Astudillo Flores told Imagen radio that the gang members were taking revenge for the arrest of their leader, last Friday. Freddy del Valle Berdel, known as "The Donkey," is the presumed leader of the Beltran Leyva drug cartel in Acapulco. "We have information that this is a retaliation for his detention. It was the federal police who arrested him and the attack was against federal police officers," said Mr Astudillo. Some universities in Acapulco have cancelled classes for Monday but local media (link in Spanish) report that according to education authorities, schools will still be open. The US department of state has warned American consular staff not to travel to Acapulco, saying that Guerrero was the most violent state in Mexico in 2015. Tens of thousands of people have died in drug-related violence in Mexico in the past decade.